Earlier in January 2013 I had quite the adventure in obtaining customer service from The Bay. Since that blog post there has been movement on this issue with The Bay. I followed up with tweet to Ellen Roseman who replied she was glad I at least got a refund from HBC on the jacket. We are so sorry to hear that you are still having an issue. Pls DM your email and we will take care of you! Thank you. Of course I was not going to send them my contact information! HBC already had it on file at least three times with my dealings with their Customer Service Department over the phone and via e-mail. If they truly wanted to deal with it, they would pull the file, review it and then deal with it. The scripted responses from Twitter were not really helping matters. Thus, I decided a different tact was in order. I reforwarded my e-mails to their "Customer Service" Department with a request they be forwarded onto the Twitter person. I then went venturing around the internet to see if anyone else had an awesome customer service experience like myself with The Bay. I stumbled across "the maggiescene" blog and a thrilling posting on retail stupidity courtesy of The Bay. Retail stupidity? This post reads like the top 3 listing of how retail customer service should not be run. I retweeted this experience to The Bay and my own followers pointing out that I'm not the only one with an issue of customer service involving The Bay. So again I reforwarded my e-mails to The Bay Customer Service Department to forward to the Twitter account person at The Bay. I wasn't holding out too much hope for the e-mails getting to the Twitter account person for The Bay as communication with the Customer Service Department. The Customer Service Department's line of communication seemed a little suspect especially considering that original promised deadline of a Customer Service Manager calling me within "24 to 48 hours" came and went with not even a phone call or e-mail. how about you sending me your email address? I've done things #hbc way and look how far that got us. Thank you for forwarding me your e-mail address via Twitter. I trust you have yet to see the below as I believe communication is to be subpar at HBC. As you can see I've been through a lot with The Bay and am very unhappy about it. I've reviewed issues online to see other people have had issues with obtaining fashion items advertised and then getting support for products sold when the item doesn't live up to regular wear and tear within a year. Bottom line, I asked for something simple from The Bay: To contact the manufacturer in order to assist in resolving the issue. Of course being a good customer I also let The Bay do something as well if they wished (see first e-mail below). Instead, all The Bay gave me was the runaround in customer service. Nobody at either The Bay Customer Service or at The Bay Rideau Street Stor in Ottawa had the number for Misty Mountain. This is unconsionable, as I've stated before, because after attending at least 6 different The Bay stores in the Toronto and Ottawa areas, the largest amount of floor space is to non appliance items and especially fashion. I cannot figure out how nobody would want support if a seam went on a shirt, a zipper had issues or a button fell off. To make matters worse it seems that The Bay Customer Service Managers are just like Rogers managers: NON EXISTANT. When I spok to Daishawn on my last call to The Bay Customer Service Phone line on Tuesday, he promised a Customer Service Manager would call me within 24 to 48 hours. As of 1:30 P.M. today Eastern (Ottawa/Toronto Time), I will be at 72 hours and counting. I'm not really holding out much hope. Customer Service at The Bay in my memory has seemed lacking. I've been shopping at many Bay Stores in the Toronto area (Hillcrest Mall and Upper Canada Mall) to not find anyone on the sales floor to help. I've also worked in merchandising at The Bay store at Yorkdale (supposedly "Flagship store") to also have to explain to customers I don't work for The Bay, but I believe the item you are looking for might be in this aisle. Added to the above, my simple experience of trying to get a zipper pull fixed. If it were not for Matthew at The Bay's Rideau Street store or a separate attempt at The Bay's St. Laurent store, I would have turned my story over to Ellen Roseman of the Toronto Star to follow up with both The Bay and Misty Mountain. So what am I looking for from The Bay? Recognition of the time and frustration I've been put through in order to resolve this issue. The Bay has let me down big time and I'm obviously not happy about it. A call from the someone above the Customer Service Department's Management level would suffice to restore some trust in me as a possible The Bay store customer. Why not a Customer Service Manager? They obviously don't care as shown by: A. No availability when I called in 2 times, B. Customer Service Management's obvious refusal to call back. C. Not providing their front line Customer Service agents with simple contact information to manufacturers beyond those for major appliances. Please look into the above, and ensure The Bay acts accordingly. Silence from The Bay will obviously speak volumes. I wasn't expecting much from The Bay. After all the Customer Service Department was making their title into a farce with no "service" being provided except for bafflegab and runaround for a simple thing: contact information for a manufacturer of products The Bay sells. But apparently I was wrong. I had a chance to read through the emails and your blog. The poor service and run around you’ve been given is completely unacceptable. We are embarrassed by the unwillingness of our customer care centre agents to address the problem with your jacket. The lack of follow-up by a manager is also very unprofessional and highly concerning. On behalf of our President, Bonnie Brooks, and our senior leadership team, we hope you’ll accept our sincerest apologies. We’d like to send you a Hudson’s Bay Company gift as a token of our apology. Could you kindly provide me with your mailing address? Yes, The Bay wanted to provide something as an apology for what I went through and was even extending an olive branch to welcome me back to their stores via sending a gift. I replied the next day, January 11th, to the e-mail with my address. I got a little concerned a week later when there was no response to my e-mail to say the item had shipped. Though The Bay had either not received my e-mail response or was ignoring it. But there was still a feeling there that The Bay's President Office would respond. Shayne Tryon wouldn't let me down though, January 18th (a week after my e-mail) he responded with an e-mail saying my gift had shipped. The gift, what could it be? A pair of Olympic Mittens? A HBC striped wool blanket? What could it be. Fast forward to January 22nd (yes it apparently takes 4 business days to ship stuff from Toronto to Ottawa), I debated, while putting on my Roots winter jacket, about going out to grab a coffee or do a quick shovel of my driveway then go for a coffee. I chose the shovel first and then head out for coffee option. Good thing I did! Three swipes of the driveway and a Purolator truck rolls up, the driver shuffles around for a minute, and opens the door with a big smile. He hands me my package, I sign for it, and he drives off. I look at the return address "HBC Mail Room"! I dump the snow shovel into the snowbank and run inside. I unwrap the intricatly taped and wrapped brown paper to find a red box inside. 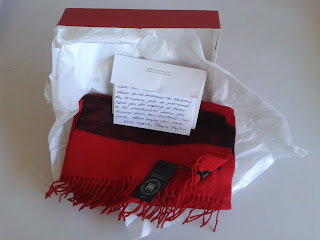 I open the red box to find, wrapped again in tissue paper, a red scarf! A signed note also accompanied it on Shayne's stationary. In the end, The Bay seems to have redeemed itself with this reaching out to an unsatisfied customer. I'm hoping The Bay will work toward improving their "Customer Service" Department so that within the next year or two that department can be renamed the "Service Excellence" Department. The Bay customers can only hope that is the case. As for me, I will rethink about shopping at The Bay. Sure I'm not likely to purchase a winter jacket, but I may see if they have winter boots or other items available should the need arise. Ellen Roseman deals with similar and other issues on a daily basis. She has recently came out with her own book on how consumers can "fight back" or let companies know they are unhappy. She has also given several tips and examples on how to use social media to get what you want. After failing to get any satisfaction with The Bay's Customer Service Department, I turned to social media (i.e. this blog and twitter) to both let the public know what happened to me and to provide an opportunity with business about how I was treated so other customer's won't be treated again. The Bay, unlike like Rogers, eventually understood the error, made a valiant attempt at retaining this customer for the future and probably will improve their Customer Service by not repeating the same calamity over and over again. As a fellow canadian (but living in the US), HI! I was doing a search on google for customer service issues relating to HBC and Lord and Taylor (their sister company here in the US) and came across your blog. I am so so glad that you posted and blogged about your experiences with their customer service and how your issue was handled. I have been dealing with L&T's customer service since november of last year. Long story short - I gave them my engagement ring for cleaning and possible replacement of the original stone. Since then, they replaced my stone with a terrible quality stone, lost my original stone, then said they found it (but it wasn't mine, I was sent back what I refer to as my "fake" stone) and on and on. Its an issue that is still ongoing. I dealt with customer service for about a month and a half and then finally took to my blog, their facebook and their twitter accounts to see if I could get any results. It made all the difference in the world by calling their company out on what was going on, on social media. At the moment I am in touch with Shayne Trayon and having read your experience with him, I am hoping for a resolution soon to my issue.